Tokyo, June 5, 2013 - Hitachi, Ltd. (TSE:6501, "Hitachi") today announced that it has completed an upgrade to the production capacity at PT. Hitachi Power Systems Indonesia ("HPSI"), a manufacturing subsidiary of its power transmission and distribution systems business, and that HPSI has started to manufacture the first 500kV-class gas-insulated switchgear ("GIS"*1) in Indonesia. To commemorate these achievements, HPSI today held a formal ceremony which was attended by many important guests, including key executives from the Ministry of Industry, Ministry of Energy and Mineral Resources and Perusahaan Listrik Negara Persero. This new capital investment is one of the measures to strengthen the global value chain of Hitachi's power systems business. The power transmission and distribution market is expected to grow rapidly in Indonesia and the other countries of Southeast Asia, as well as the Pacific Rim. In order to capture the market growth, Hitachi intends to utilize HPSI as one of its key production facilities, as it seeks to expand sales of power transmission and distribution systems. Demand for both primary power sources (consisting mainly of gas turbine and coal-fired power plants) and renewable energy generation (such as wind and photovoltaic power generation systems) are anticipated to expand in Indonesia and the rest of Southeas Asia and the Pacific Rim, as their populations grow and economies develop. Accordingly, further upgrading of power transmission and distribution networks will be needed to keep up with the expansion in generation capacity. Since it was established in 1995 at the East Jakarta Industrial Park located in the outskirts of Indonesia's capital, Jakarta, HPSI has been building a solid track record as the only company to manufacture high-voltage switchgears in the ASEAN region. The new capital investment at this time has more than doubled HPSI's production capacity of ultra-high-voltage GIS, thanks to the installation of the latest manufacturing equipment and the construction of a new assembly line. Through this investment, Hitachi will position HPSI as one of its key global sites, and will utilize HPSI's capacity to meet the growing demand for the upgrading of power transmission and distribution networks across ASEAN and the Pacific Rim, as well as its existing domestic market in Indonesia. Through this production capacity upgrade at HPSI, Hitachi intends actively to promote its strengths in ultra-high-voltage power transmission and distribution systems in Indonesia and the rest of ASEAN and the Pacific Rim. Hitachi is also working as a group to further strengthen its businesses, with the aim of expanding sales across the globe. GCB: Acronym for "gas circuit breaker". A circuit breaker switch that disconnects electric power when required for operational and equipment protection at substations. To reduce the area required for installation, the devices are housed inside tanks filled with a gas that has superior insulation performance to air. PT. Hitachi Power Systems Indonesia, a wholly owned subsidiary of Hitachi, Ltd. and Hitachi Asia Ltd., headquartered in East Jakarta Industrial Park, Indonesia, offers electric power equipment and systems including Gas-insulated switchgears, Gas circuit breaker for ultra-high-voltage and high-voltage power transmission and distribution in Indonesia as well as supplies advanced technology and excellent quality. PT. 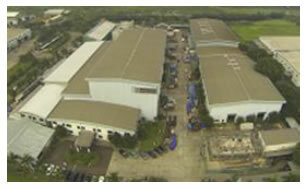 Hitachi Power Systems Indonesia also exports the products to many countries and regions around the world. For more information, please visit us at http://www.hitachi.co.id/.